Wheel hub bearings. Room for one more ball? 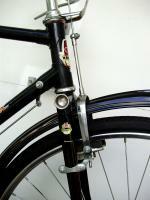 Bicycle Repair Forums - BikeRide › Maintenance & Repair › Wheels & Hubs › Wheel hub bearings. Room for one more ball? Recently my bicycles wheel hubs are showing their age and need a proper servicing. I have stripped down both wheel hubs and was surprised to notice that I could comfortably, without any steady handed trickery, fit two more bearings in the cup for my rear wheel hub and one more bearing in the the cups of my front wheel hub. According to the Shimano tech document my rear hub takes nine 1/4 inch ball bearings per side and the front hub takes ten 3/16 inch balls per side. Should I stick with what Shimano is saying or should I pack the cups with as many bearings as it can comfortably take??? It is normal that 1 additional ball might fit in (though usually it would be slightly too tight). If there's really room for one additional ball (and everything can be assembled as it should, check over locknut distance and orientation of axle) I probably would put it in. Nope, no caged, just loose in the cup. I have since been advised by the LBS that it is normal for the cup to not be completely filled with bearings and to simply obide by the Shimano tech docs. This last advice is standard for any loose ball cup and cone bearing. (10-21-2011, 11:58 PM)d3v Wrote: Nope, no caged, just loose in the cup.